1) Select the puppy you want from the “Puppies for Sale” page. 2) You can then call us or e-mail to confirm availability and answer any question you have about the puppy. 3) We are set up for all payments to go through Paypal. so once you have found the right puppy, please use the provided links on the "Puppies for sale" page. 4) If your puppy is less than (8) weeks old, we require a nonrefundable deposit to hold your puppy in the amount of $500.00 dollars. If the puppy is over (8) weeks old, we require the purchase price to be paid in full. 5) You must then decide whether you will pick up the puppy or have it shipped to a major airport near you. We will gladly make all flight arrangements for your puppy’s arrival. We will need to know what dates and times work for you to pickup your puppy. 6) The puppy’s registration papers will be mailed to the new puppy’s owners once you have received your new puppy. 7) We are available to answer any questions or provide support for your new puppy as he or she grows. You can call us or E-Mail us and don’t forget to send Pictures!!!!!! 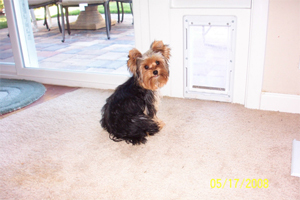 You can still add a Parti Colored Yorki to your family! Please read the "Transportaion" page for information about recieving your new puppy.